As a busy working professional, I find myself craving quality time with my horses, but am too strapped for time to commit to a full show schedule. I’m sure I’m not the only one in this situation. What non-competitive activities, then, are available for the busy, but dedicated, rider? One activity I encourage you to try is foxhunting. I have been foxhunting since I was a child. I use it as a fun way to get my horses fit and sure-footed for eventing competitions. In England, event riders commonly hunt their young horses before eventing them, because it teaches horses (and riders) how to safely gallop across the country and look after themselves – the horses develop what Olympian Lucinda Green calls the Fifth Leg. A few years ago, I had a young horse that tripped and stumbled constantly. He simply did not know where is feet were. One season of foxhunting cured him, and now he is a fun and safe allround horse. Lately, though, I have been foxhunting primarily as a way to enjoy nature and to enjoy my horses. Nothing is better after a grueling week in the office than waking up early on Saturday and spending the morning on your favorite horse, in the great outdoors, with likeminded people. You can try out foxhunting by requesting permission to cap. The capping fees are quite reasonable, much less than what you would spend at a show, and you get a full morning of riding across the country with breathtaking views. In the early summer, the outings are called “roading”. The pace is slow and steady, and purpose is to train and condition the hounds. I recommend trying roading first, to see if your horse likes it. In August and September, the outings are called “Autumn Hunting.” The pace is faster, but the purpose is still to train the hounds. The formal foxhunting season starts in October. For anyone interested in trying foxhunting, but unsure how to get started, the Old Chatham Hunt Club is hosting two Introduction to Foxhunting clinics, one May 31 and the other on June 21. 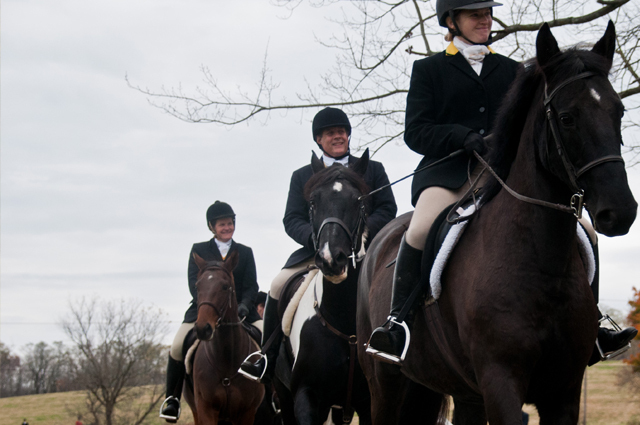 If fun and relaxing trail rides are more your style, the Old Chatham Hunt Club sponsors monthly trail rides through the beautiful hunt country in Old Chatham, with fast and slow groups. Visit oldchathamhuntclub.com for more details. And of course, feel free to contact me at stanton@mltw.com.